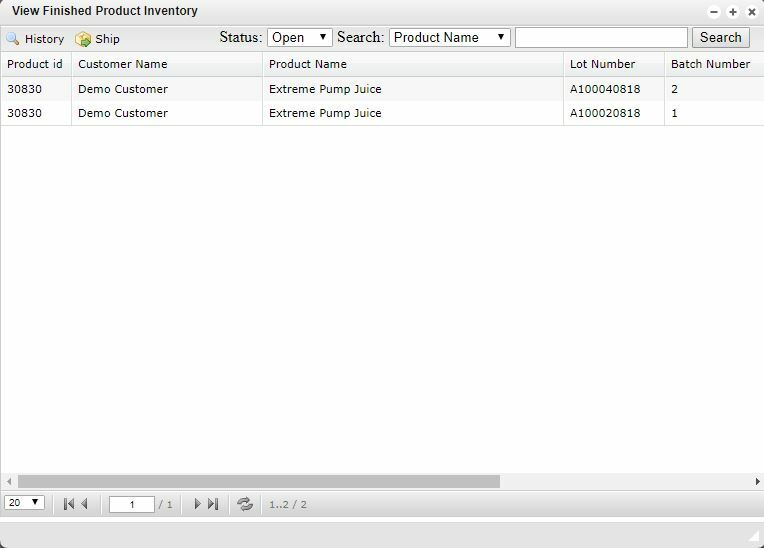 The View Inventory window provides valuable information for each finished product or lot that is currently available in the system. Knowing how much finished inventory you have on hand at any given time, as well as individual finished products and their lot number, is critical for the success of any business. To help make access to this information as easy as possible, these items are all included in the View Inventory submenu page. On the main screen, you will find two buttons on the top left corner. These buttons are labeled History and Ship. Once your requested products have been highlighted, accessing these buttons will provide more information about the requested finished products. While using this page, you have the option to hold the CTRL button on your keyboard to select multiple rows. This feature is incredibly valuable if you have multiple finished products for a single customer that need to be shipped at the same time. When the history button is accessed, a new window will appear to provide a history of any shipments that have been associated with the selected lots. Information is also available for when the product was shipped, who it was shipped to, who created the shipping request and much more important data. After a shipment is saved in Virtual Office, the amount available will automatically adjust and a new entry will be added to the finished product history. The ship button creates an order that includes any selected lots from the view inventory screen. On this page, you will have the option to input your shipping from and shipping to information as well as provide any shipping details that may be necessary such as the carrier used and the tracking number associated with the order. Once this information has been completed, simply click the save shipment button to continue.